I cannot figure out how to replace the failed disk drive of TeraStation in the RAID6/RAID5/RAID1/RAID10 mode (TS-X series). 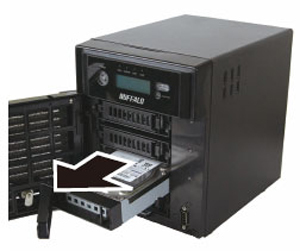 - Details of an answer | Buffalo Inc. I cannot figure out how to replace the failed disk drive of TeraStation in the RAID6/RAID5/RAID1/RAID10 mode (TS-X series). 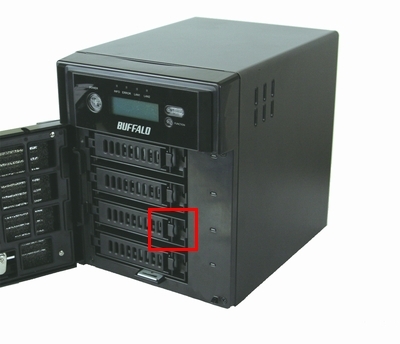 Do not replace any hard disks that are operating normally. Replace failed hard disks one by one if more than one disk has failed simultaneously. Click hereto see how to update it. 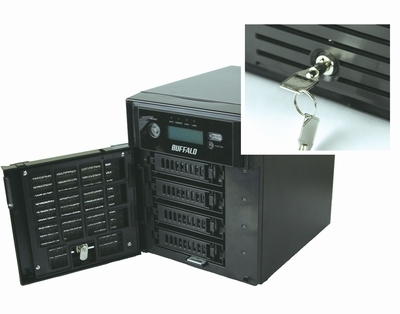 Open the front cover with the key included in the product package. Push the cartridge tab of the failed hard disk (denoted by the status LED lighting in red) to the left, and pull it out toward the front of the unit. Hard disks with the status LEDs not lighting are still active. Do not unplug or remove them. Pull out the hard disk together with the cartridge, and remove it from the TeraStation. 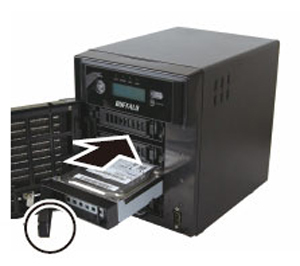 Insert the new inernal hard disk (sold separately) into the slot which became empty after Step 4. Insert it while the tab is still open. Push the disk into the TeraStation, and push the tab towards the back of the TeraStation until you hear a clicking sound. Turn on the TeraStation if not powered up due to the configuration. All data on the newly installed internal hard disk will be erased during this process.